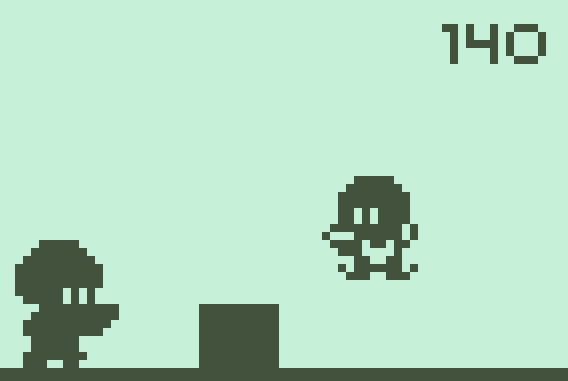 Hostage Hero 3310 is a demake of my previous title, Hostage Hero. This was made as part of the Nokia 3310 Jam. It was built using a 84x48 resolution, which has been scaled up for this release. This was made in roughly 7 hours (some time spent poorly) and is my first proper dive back into game development in a couple of years. The game starts off slow but speeds up the longer you survive. There's a lot that can be improved here, but if you're curious, here's the source code. If you know how I can improve the game/code. Please let me know! The player: this is you, controls down below. A box: this is one of the obstacles you'll face. You simply have to jump over it. The enemy: this is another one of the obstacles you'll face. You cannot jump over him. You must shoot him before he gets too close.